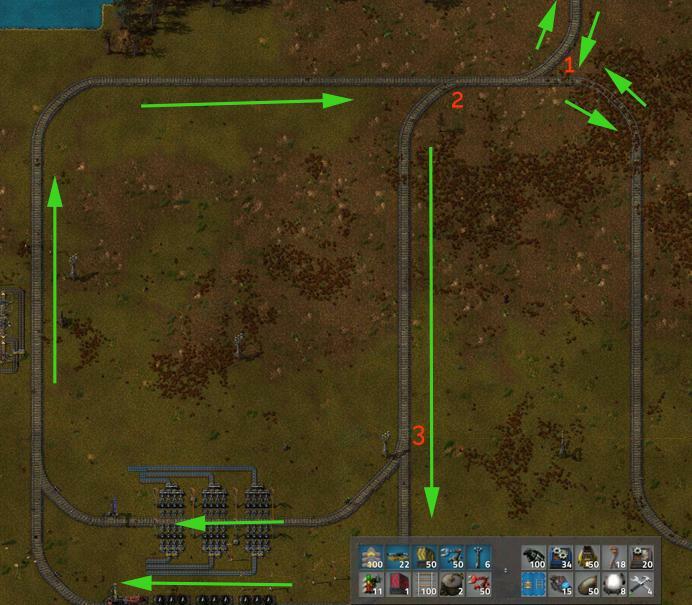 I've followed a few videos on train signalling for Factorio but whatever order I do the signals, both trains when in the stations will constantly say "No Path" until I remove all the signals at the junction. Can anyone tell me how to signal this junction so both trains can use it properly? Or perhaps I need to remake the junction instead? I've tried having normal signals coming into the junction from all sides but it doesn't seem to work. Where do I put the signals? Train signals are a little bit weird at first, but when you understand them it makes so much sense. All tracks except for the top right ones are one-way. Every train signal defines a "block". When a train enters that block, the signal displays 'red' and other trains can't enter that block. Because there is a train after the signal, it becomes red. Dark yellow represents the block that the signal creates. Chain signals work the same way, except they inherit the status of the next signal. If a track splits, it checks both ways. If one of the tracks is not empty, the chain signal becomes blue, signaling the train that only one of the train tracks is empty. When the train is coming from the left, the chain signal indicates which of the tracks is empty (dark and light blue block). When the train is coming from top/right, the chain signal indicates whether the (dark yellow) block is empty. 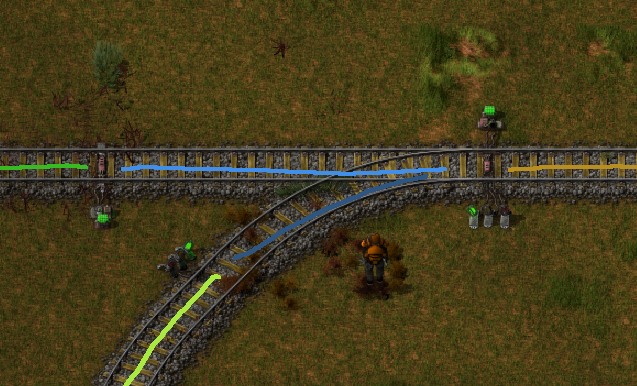 If you want, you can place more rail signals on the right side of the top left track so multiple trans can wait in line to leave, but that's just aesthetics. Two-way chain signals on the outbound rails (top and right paths). Just place a signal on both sides of the rail at the same spot to do it. One way chain signal on entry to the junction (left path). One way standard signal on exit from the junction (bottom path). 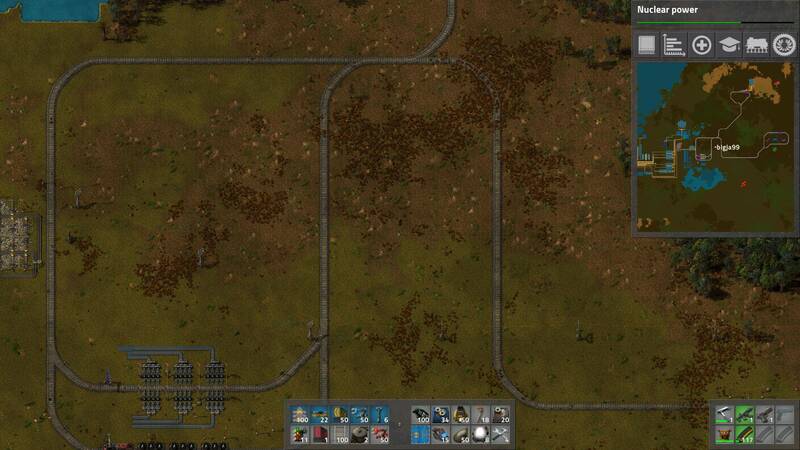 Make sure a train can fit between the exit signal, and the signal after it. Make sure entry to the two-way part from the remote stations also has a chain signal. Trains will refuse to pass to another block unless explicitly there's a green light (from a signal) saying it's OK.
As a result, placing a signal on one side works like a diode (only one direction), so if you want to allow trains to pass the block boundary in another direction then it needs an explicit signal. If you then add that a signal turns green if the block on the guarded side is free of trains, then you can use this to build up a train network. How many missions/levels are available in campaign mode? How can I encourage alien expansions? 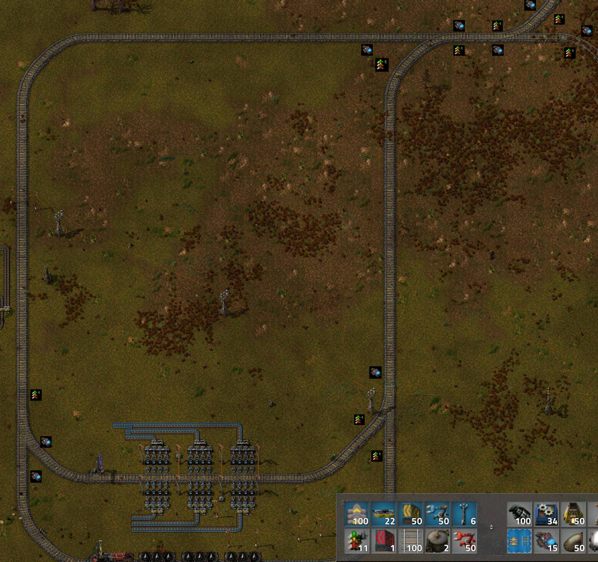 Why aren't trains using all the available stops? How do I design a combinator circuit to keep track of a train's contents, even when not at the train stop? How does splitter sorting work? 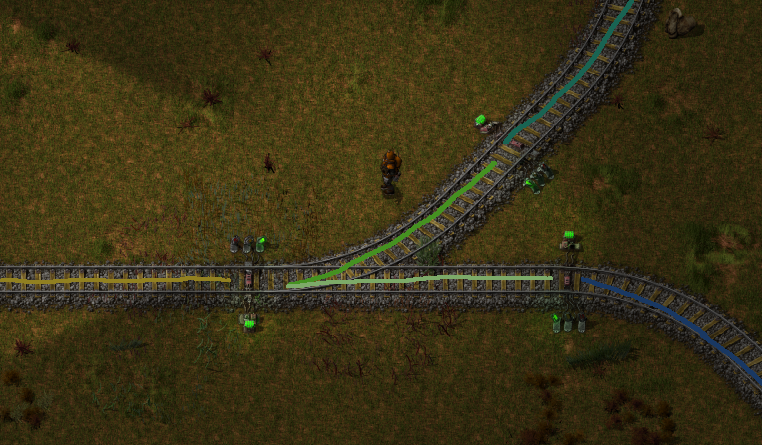 Factorio: How to play programmable speaker when train stopped?